Just like everyone else in the country, Allison and I are trying to start 2013 off right. And by "right," I mean like... healthy. I do have my wedding this year so it's time to get serious. As such I have been stepping up my workout routine by hitting up Pilates 2x a week and the gym 2-3x a week for some cardio and death by TRX. Seriously has anyone tried TRX? GOOD GOD! Now, since I only had the workout wardrobe of someone who frequented the gym less than regularly, I needed some more options. Specifically CUTE options that would get me excited to go to the gym. Enter ThomasKelly. Their motto? To take preppy from exercise to errands. Hello match made in heaven for a Marina girl like myself. 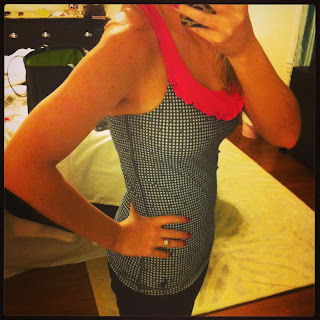 Kelly was kind enough to send me the Malaga Mix tank to cure my workout wardrobe blues and let me tell you- it worked! The tank is equal parts adorable, comfortable and flattering. I mean, isn't one of the biggest concerns with workout wear making sure your lumps and bumps you are trying to get rid of are hidden? 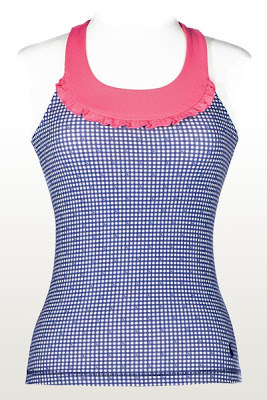 Well let me tell you, the adorable navy gingham pattern and thick fabric do just that. Here's my shot in the tank to prove it. Now here is the really exciting part. Thomas and Kelly have kindly offered to give away a ThomasKelly Malaga Mix tank to one of the Tartan & Sequins readers!! Use the widget below to enter to win. The giveaway will close on 2/18 and a winner will be announced on 2/19. Good luck! I'd love to enter to win, but don't see a widget posted... does a comment count?! Such a cute tank; loving all their preppy workout gear.